Remember when video stores were actually big buildings where you went to rent videotapes? Those videotapes have been replaced by DVDs and Blu-rays and the stores have been downsized to kiosks in the supermarket foyer. And, frankly, those red boxes are now pretty much just for the dinosaurs who insist on putting their hands on a disc rather than streaming content. The strip mall lords have subdivided my old video store into a frozen yogurt shop and Verizon cell phone store, where, ironically, I bought my cell phone that I can watch movies on. All that happened in the past 25 years, one-quarter the number of annual meetings RSNA celebrates starting later this month. It’s also no coincidence that the medical arts and popular arts share a similar rapidly evolving timeline because they represent different aspects of an ever-changing digital age. Some days such change makes me want to wander off and curl up in the local tar pit, but only on some days. Generally, I really like the fact that my monthly Netflix subscription costs about the same as two videos would have back in the day (not counting the all-too-frequent late fees). It’s also really appealing to decide on the spur of the moment that I want to watch Benedict Cumberbatch reinvent Sherlock Holmes or Marilyn Monroe beguile Tony Curtis and Jack Lemmon in Some Like It Hot. It does not require a trip anywhere; all I have to do is pick up the remote and move the cat off my chair. That is positive change. Radiology has experienced a similar digital transformation. While not as entertaining as streaming a really funny cat video, RSNA is far more intellectually stimulating and provides an exponentially more valuable contribution to society. The annual trip to Chicago to witness the products of that change still intrigues me. You can stream RSNA, but unlike the video store, going there is actually better. So, I hope to see many of you at RSNA. Stop by booth 3218 in the South Building. Use our RSNA 2014 Navigation Guide to plan your visit to the massive exhibit halls and decide which education sessions you don’t want to miss. 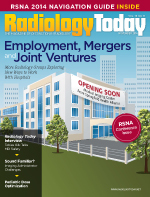 This issue also contains Tim Boden’s timely feature on radiologist employment, mergers, and joint ventures. These arrangements are chipping away at traditional radiology groups in this time of change. Boden’s article contains insights for both the hospitals and radiologists who may be part of these arrangements.